For Western Christianity, the first day of Lent, a movable fast that begins forty-six days before Easter, is Ash Wednesday. For many denominations, this day is commemorated by the wearing of ashes on the forehead in a cross shape ~ a reminder of our human frailty, and of mourning and repentance before God. The ashes are usually gathered from the burning of palms from the previous year's Palm Sunday, the day that announces Christ's triumphal entry into Jerusalem, also the day that marks the beginning of His Passion. Lent is a time of preparation for the celebration of Christ's glorious Resurrection, and is marked by prayer, penance, repentance, fasting/self-denial and almsgiving. You may be thinking, if Lent is such a serious, contemplative time, a time when believers "give up" or "offer up" something for these forty days, why is this post about jewelry? The answer is that, for many of us, our religious jewelry ~ our crosses, crucifixes, rosary beads and the like, are a personal call to prayer, a call to behave as a Christian, a reminder and a statement of who we are and Who we belong to. So for the next few paragraphs, we'll highlight some of the Christian jewelry our customers have purchased over the years. 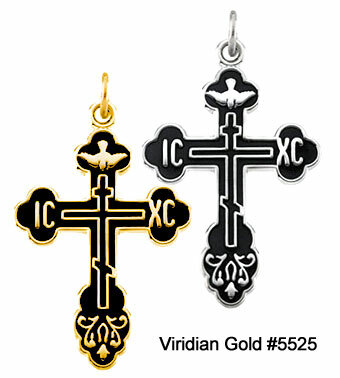 Cross pendants: St. Xenia Cross #5525 is rich with Christian symbolism, from the St. Andrews cross adorning the center to the vine design at the base that represents the Cross as the Tree of Life. A customer favorite, Alpha/Omega Chi Rho Cross #5267 makes a statement that the wearer recognizes Jesus Christ as the Alpha and the Omega, "the first and the last, and there is no God besides me..." (Isaiah 44:6). 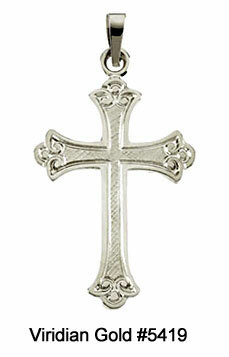 To view our wide selection, see Cross Pendants in Gold, Silver, Platinum and Stainless Steel. 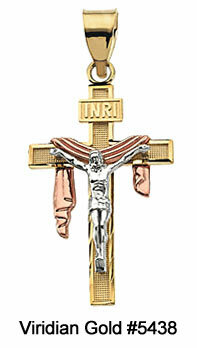 Crucifix pendants: One of our most beautiful crucifix pendants is Shroud Crucifix in Tri-Color Gold #5438. A rose gold shroud drapes the arms, signifying that while Christ died on the Cross, He rose from the dead, leaving His burial wrappings in the tomb. The Sterling Silver Passion Crucifix #5597 is designed with pointed tips that symbolize Christ's Passion. 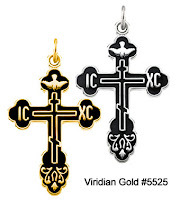 See Crucifix Pendants in Gold and Silver to view our entire selection. Rosaries: We offer a selection of 5-decade rosary beads for men and women, and rosary bracelets in both sterling silver and 14K gold. Rose Quartz Rosary #2189, crafted in sterling silver with genuine rose quartz beads, is but one example. Customer favorites include Wrap Gemstone Rosary Bracelets #3090 and Rosary Rings in Gold and Silver. We have not forgotten to include cross and crucifix pendants for children, such as our beautiful, Child's Petite Floral Cross Necklace #2222 and Child's Fleur-de-Lis Crucifix Necklace #2208. We also offer a selection of medals and pendants for First Communion, Confirmation and Baptism. Whatever your jewelry preferences for Lent and for Easter, we wish all of our customers and readers a holy and fruitful Lent.